Today in the fast and technology world people have costly mobile phones. In Android mobile phones people run lots of applications. Some of the applications are too much heavy and they take too much mobile storage space but some applications are not heavy. Sometime we need to reset our mobile phone because of some reasons, these reasons may be..
Resetting your mobile phone may have lose of important data. This Data include.. But people forget about one thing that is " APPS ". No need to download applications again and again. To take backup in android mobile we need an application named as "APK EXPORT"
Step 2: Install and Run Application. Step 3: You will see list of pre installed and after installed apps List. Step 4: choose Important application and tap on it. Step 5: You will see and share button and a save button, click on save application. Repeat steps 4 and 5 for the all the important applications. Where to find apps bakcup file ? Step 2: In Internal storage , Find folder named as "APK". Step 3: Now open the folder and you will see all the applications you have backed up. 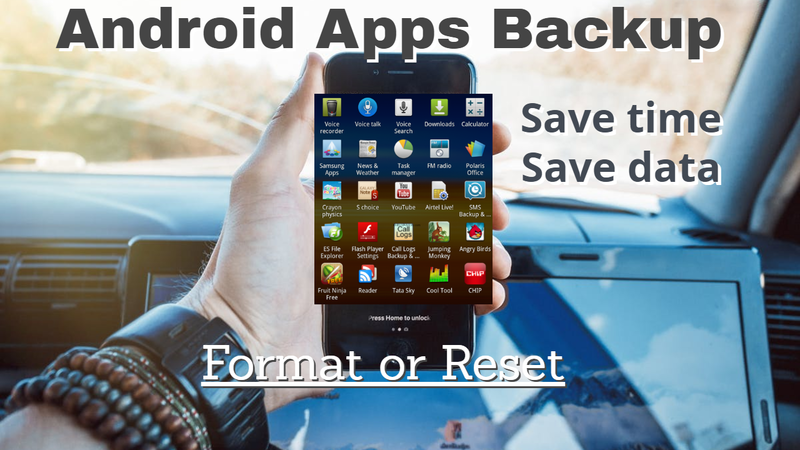 Important :- Move backed up application into SD card before reset your mobile phone.